With a custom design by Scalo, the kitchen is “white and simple; we didn’t want handles,” notes De Graaf. The hotplate, oven, and teppan-yaki grill are from Falliss. 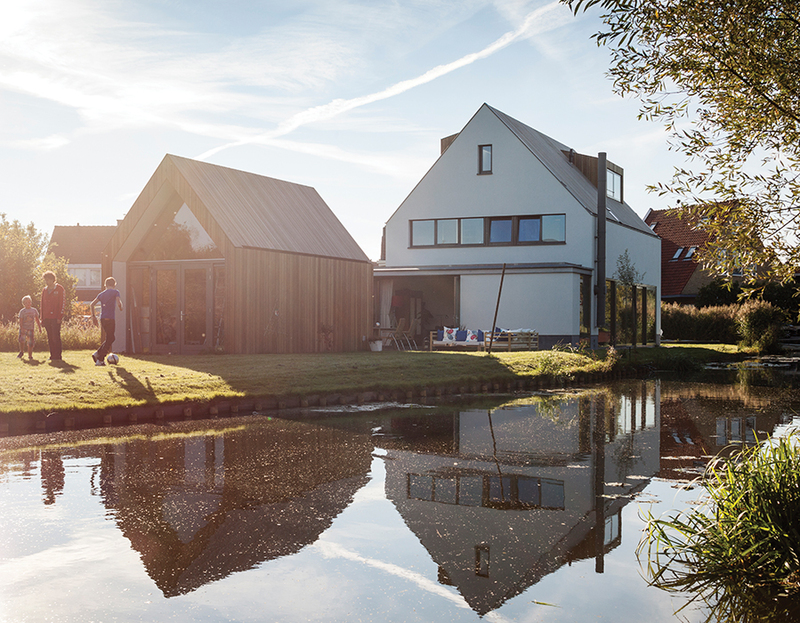 The rainy Netherlands may seem a long way from the sun-soaked Caribbean, but for Mark de Graaf and his family, the island of Curaçao, in the Lesser Antilles, was the inspiration for their new home on the outskirts of Amsterdam. “We have a holiday home on Curaçao, and we wanted the same indoor-outdoor feel,” says De Graaf, nodding toward the ground-floor glass wall that frames a restful natural view. This side of the house is a couple of feet from the water outside: Originally an agricultural drainage channel, it’s now a haven for herons, coots, ducks, and other wildlife. De Graaf, a businessman, and his partner, Sanne Wisman, a doctor, were living just around the corner with their sons Bram, 14, and Dirk, seven; their daughter, Fien, ten; and their dog, Bommel, when the plot went on the market. A dilapidated farmhouse had been demolished, and the family was entranced by the site’s waterside setting. “It’s hard to believe that we’re just 15 minutes from the bustling center of Amsterdam,” says Wisman. Attracted by the area’s country setting, the couple had given hardly any thought to building their own home. “Initially, we thought we could get a flat-pack house,” says De Graaf. “But we quickly changed our minds when we saw what was available.” They turned to architects Huib van Zeijl and Daniëlle Segers of the local office Équipe, who had worked with De Graaf before, designing car washes. While the collaboration between architects and clients was smooth, dealings with the local planning authority were more complicated. “In a typically rustic area like this, regulations are very conservative,” Van Zeijl says. The height of the roof, for example, was not allowed to exceed 29 ½ feet—an obstacle, since the brief called for a three-story house, as De Graaf and Wisman wanted their bedroom on a separate floor from the kids’ rooms. The architects solved this issue by sinking the ground floor by 15 ¾ inches, fitting all three floors into the structure. The look of the home was determined by a planning requirement for “traditional” materials and shapes. “It’s a modern translation of a kid’s drawing of a typical Dutch house,” Van Zeijl says of the simple pitched-roofed design. The architects nevertheless avoided the traditional brick and tile in favor of an even older, more common material: wood. The timber roof adds a fresh, surprising touch to the archetypal building form and creates an interesting rhythm with the wood cladding the lower section of the house on the entrance side and the white plaster used for the middle zone. On the ground floor, the facade morphs into a garden fence, which then becomes the wall of a smaller house. This little structure represents another triumph over the strict planning regulations. Classed as a shed (and therefore exempt from the usual rules), it adds vital space for a guest room and storage, despite the limited allowable footprint. It also contributes a playful element to the design—a smaller volume corresponding to the larger one—and helps to create a sheltered terrace between the two structures: another of the inside-outside spaces that the family members enjoy. “We really love the contrast between the wood of the roof, facade, and fence and the white stucco in between,” says De Graaf. At night, the long expanse is beautifully illuminated. “It’s a bit of a local landmark,” says Wisman. The only downside with the material, she adds, is that “people can’t always find the door.” Once the entrance is located, however, visitors step into the triple-height space of the hall, which is bathed in daylight from a window and a skylight above. To the left is the kitchen, with its gray Mosa tile, sleek white units, and granite worktops. This flows into the dining area, which has a raised Piet Boon fireplace as a focal point. “We use it every day in the winter,” says De Graaf. The dining area leads into the L-shaped living area; both share a long glass wall and waterfront views. Oak flooring adds warmth, as does art by Wisman’s mother and various colorful pieces brought back from Curaçao. At the opposite end of the house from the kitchen, more glass doors open up to the outside, connecting the living room to the main terrace, the small guesthouse, and views of fields beyond. An oak staircase, positioned opposite the entrance, leads to the cellar below (used as a den and for storage) and the bedrooms above—the kids’ rooms and a bathroom occupy the second floor, while the master bedroom and bathroom are on the top floor. The house’s interior demonstrates the same lucid simplicity and clean, flowing lines that characterize the exterior. While uncompromisingly modern in attitude, this home fits naturally into its context: a little street of semirural dwellings, most of which are many decades old. “The best thing about living here is that we add to the local scenery,” says De Graaf. “Often, I’ll hear people say of our place as they walk by, ‘Now, that’s a nice house!’” Presumably, the planning authority would be happy to hear that, too.